VIE Hotel Bangkok, MGallery by Sofitel is pleased to announce the appointment of a new Executive Sous Chef, Yuya Okuda, effective immediately. Chef Yuya, from Tokyo, Japan, will oversea the creation of new dishes and maintain the high quality of cuisine and service in one of the most exciting eateries in town, La VIE – Creative French Cuisine. With a range of successes under his belt, Chef Yuya has had long term and passionate relationship with French cooking. Soon after his graduation from Tuji Culinary Institute in Japan, in 1998, he worked in France for two years, most notably at Michelin-starred Chateaux de Marcay in Loire. Returning to Japan, he took a position at Taillevent Robuchon in Tokyo, followed by a situation at the resort hotel Niki Club in Nasu. He then served as sous-chef at Angelina in Ginza, and later became the executive chef at Villa Oriental. He has also gained valuable experience at the Japanese “Izakaya” bar, a Spanish tapas restaurant and a French bistro. 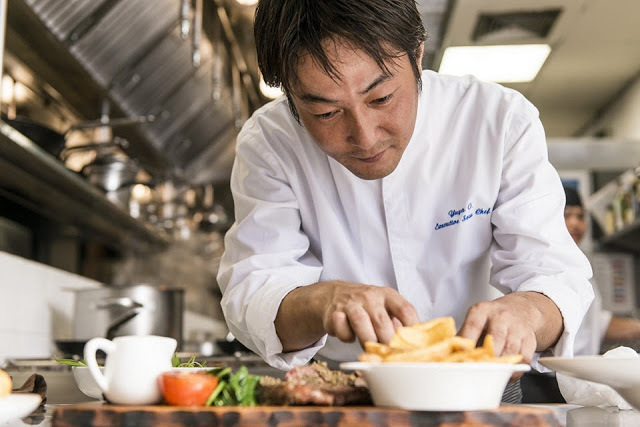 In time, absorbing all these styles and systems, Chef Yuya not only became extremely adept with French cuisine but also developed a unique culinary style of his own. Chef Yuya comes to VIE Hotel Bangkok from Maduzi Hotel Bangkok, where he has been the executive chef since May 2010. While keeping solidly within his French culinary style, Chef Yuya also employs different culinary techniques from Japan, China, Spain and other countries to create his one-of-a-kind Yuya style, which is fast becoming increasingly admired and, need we say, deeply enjoyed. Please join us in welcoming our new Executive Sous Chef Yuya Okuda to VIE Hotel Bangkok.